This colorful and trendy design is buzzing with character! 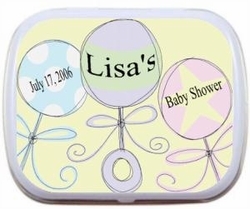 Each personalized mint tin will arrive brightly colored as you see above. 3 Baby Rattles in different colores and personalized with your name, date of shower and event (baby shower,etc.). Really cute design!